*Note – This post contains affiliate links, however the opinions are my own. Affiliate marketing is something that I’ve been familiar with for a number of years. In fact, when I first got into online marketing, one of my responsibilities was to manage affiliates who would promote our company’s products in order to make as much money as possible. I did try it several times (half-heartedly I’ll admit) and failed. But over the years, I’ve seen many travel bloggers and influencers use affiliate marketing to their advantage. They actually generated referral sales and an income without trading their time. I’ve been fortunate to work as a digital nomad since 2015, however the model that I adopted which was a combination of freelance work, which evolved into me developing an agency saw me trade my time for money. Even though I was travelling to exotic places like Thailand, Malaysia and Indonesia, I wouldn’t get much time to really explore the different countries that I was visiting due to my business’s commitments. I think one of the things digital nomads need to consider is how they can grow their income without having to invest so much time into their venture in a way where it takes them away from their intentions to travel. So in 2018, I decided to jump back into affiliate marketing and to get serious about making it work. It is still early days, but it is one solution that will allow me to free up my time in exchange for building a marketing/promotion model that will generate referral based income. Affiliate marketing benefits for digital nomads. The main thing is being in a position where you can earn an income passively. This is because you’ve developed a marketing system that converts in exchange for an income. Building out the campaign will take time. However, once you have developed that campaign, it should work for you on autopilot. What type of affiliate marketing models are available? The main model is getting paid a fee for every referral that you make through your affiliate link. The great thing about this model is that you don’t have to do any of the fulfillment. So as long as the affiliate partner that you are working with has a good conversion and delivery model with their business, all you will need to do is send them qualified traffic and leads to convert. There are also other models such as pay per call, cost per action (CPA, also known as pay per lead), and there is a cost per install. Some of the CPA models command $50-100+ or more per lead. So this can turn out to be a very lucrative model that can work passively or with little time invested. It depends on a few factors. You might make a few dollars a month or you might make tens of thousands of dollars a month. Super affiliates make over $50,000 a month promoting products and services for businesses. If you focus on specific niches, you can build up your passive income to $100-1000 a month. Which affiliate networks/partners are good to start with? If you are a beginner, I would recommend that you start with the Amazon Associates Program. The reason being is that Amazon has millions of products listed on their platform. So you will be able to test several different niches and see how affiliate marketing can work for you. It is free to join Amazon’s affiliate program. Click here to learn more. There are a couple of drawbacks to the program that you should keep in mind. The affiliate cookie only lasts for 24h. Most affiliate programs will give you a 30-day cookie for any referrals that you make. However, this isn’t the case with Amazon. If the person decides to purchase an item after the 24h period, you won’t get any commission for the sale. This makes it more challenging as the person that you refer needs to be ready to buy whatever is being offered as soon as you refer them. You rely on the seller to deliver. The Amazon platform is good, but it is comprised of several market sellers. Some are good and some aren’t so good. You will get paid on the delivery of the product. If you have made the sale and seller fails to deliver, you won’t get any commission for your referral. Additionally, if the customer cancels the order, you won’t receive any commission. Deductions on refunds and returns. If the customer returns the product in exchange for a refund, the commission that you have earned will be reversed. There are good benefits to the Amazon associates program. You earn a commission on sales via your referral link, not just the product referral. This is really beneficial since you can earn commission from other products that you aren’t promoting. However, since you referred the person, you will receive the commission. You can set your payment threshold and opt to receive a check or Amazon vouchers. There is more credibility with Amazon. Unlike promoting other offers on other platforms like Clickbank, you get to work with products that have credibility through product reviews and seller verifications. This makes it easier to generate sales. Especially if the product that is being sold isn’t a well-known brand. I’m still trying to get things working well with this platform. Many other successful affiliates vouch for this platform due to their deals, the partner offers available and the cookie window. These guys specialise more in CPA and offer higher payouts than most other affiliate networks, however the types of funnels needed to convert can be more tricky than some of the others platforms like Amazon’s affiliate program. That being said, it is possible to earn 10x more per referral. Click here to join MaxBounty’s affiliate program. As you become better, you will seek out and find other affiliate marketing opportunities. There are quite a few helpful resources that can get you started in the world of affiliate marketing. This will help you with earning your passive income through affiliate marketing. Affiliate Buzz Podcast with James Martell. He has been an affiliate since 2003 and has expert guests on his show. It’s transparent and shares tips, ideas and methodologies that can help you improve your affiliate marketing performance. These are two very bubbly affiliate marketing guys on YouTube. Very smart and they are transparent with showing you exactly how they earn affiliate income from Amazon through content marketing. Their goal is to get people to earning their first $1000 a month through Amazon’s affiliate program. I actually took his course and there are quite a few things that I liked. He provides several videos on his YouTube channel which can help you get started in the world of affiliate marketing. Are you a digital nomad that is also an affiliate marketer? Share your thoughts and experience with us. The ideal scenario for travelling around the world fulltime is to do so by earning a passive income. This means having the ability to earn an income without actually having to trade in your time to do so. There are several ways to accomplish this, but one of the methods that has been promoted alot in the past is to do so by owning shares/stocks. I’ve personally invested in stocks and shares over the years and I want to share some of the insights about using shares as a tool to develop your passive income portfolio. Have a passive income strategy. The minimum that you will want to earn annually per person is $24,000USD. You will need to build a stock market portfolio that will allow you to achieve that. Your goal will be to acquire shares that provide a high dividend yield. Ideally, you will be able to find shares that have a dividend yield of 4% or higher. The higher the dividend yield, the more cash you will receive when the company pays out its dividends. You want to invest in shares that have low volatility. The strategy that you will be implementing will be a buy and hold strategy. The intention is to never sell the shares, but to use the shares for cashflow. The higher the volatility, the higher the risk of the shares losing their equity value. This means you can lose money. And you want to minimise the risk of you losing money. How much money will you need to start earning additional income from shares? If you work to a rule of 3% of what you have invested, it will give you a figure. For example. Is it worth investing in shares? It is an easy way to earn an additional income. There are a few reasons why I don’t personally like investing in shares. The management is under someone else. If they don’t manage the company well, then the profits and revenue growth won’t happen and you won’t benefit from owning the shares. The risk that you take is high compared to the dividend amount that is received. The risk of losing the equity value in the shares are high. You can earn an income without having to put any time into developing the business. If you invest well, the share amount will increase over time and increase your net worth. If you have a lump sum of cash and you are unsure of what to do, then investing in shares can be a good option for increasing your cashflow. Have you invested in shares? What do you think? 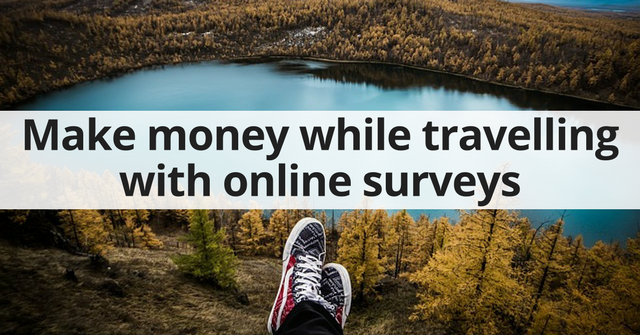 Make money while travelling by doing online surveys. One of the things that I try to encourage people to do is to diversify their income stream. One of the ways you can do that is by participating in surveys. I’ve done a few market research surveys in the past and I’ve been paid for doing the survey. BUT, the pay wasn’t that great. So the best way to think of it is that you can get some ‘extra income’ or ‘beer money’. The surveys that I’ve taken usually require 20-60 minutes of my time. When I wasn’t earning anything before or had spare time, I would participate in these surveys that would pay anywhere from $2-10 per survey. If you an get enough survey requests, you might have an extra $100 or so per month. Here’s a few that you can sign-up to. They normally just forward an email with the survey and you fill out your profile and payment details, so that you can get paid. This is an Australian-based survey provider and so far I have had a positive experience with them. The rewards can be taken in the form of cash payments or shopping vouchers or credits that can be used in the same way as money. There are several major merchants that are a part of the program, such as Coles, Xbox, Woolworths and Apple. Known as one of the biggest survey sites in the UK, they can payout up to £1 for every 5 minutes spent on a survey. Create a new email address so that it won’t get mixed up with the current emails in your email inbox. I’d also recommend checking out the following links, which have more details on online surveys. If there are others that you feel should be added to the list, please leave them in the comments section below.